Riverpark Training and Development is the only training provider in Northern Ireland that trains solely for the Crash Repair side of the Motor Industry, concentrating on what employers need and the career development of our young people. The centre already had a website but were finding it starting to get a little out of date. 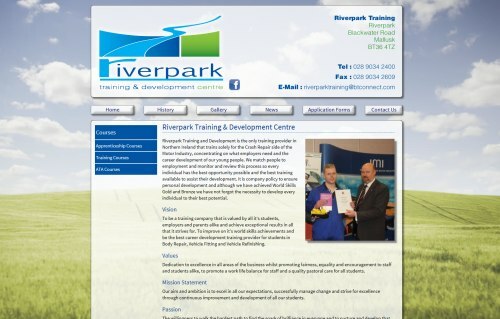 Firstly we recommended a redesign of the website to include all the new courses and content that they desired, then we discussed options with Riverpark where we will help them keep their website content including news, galleries and courses up to date for years to come. We also found ways to streamline the application process in the business with new online forms.